The so-called paranasal sinuses are bony cavities in the face; they are generally filled with air. Where the lining of the sinus becomes inflamed fluid is produced. The build up of fluid in the sinus cavities may cause pain. Sinusitis is the term used to describe sinus inflammation and may be caused by infection of either bacterial or virus origin or allergy. 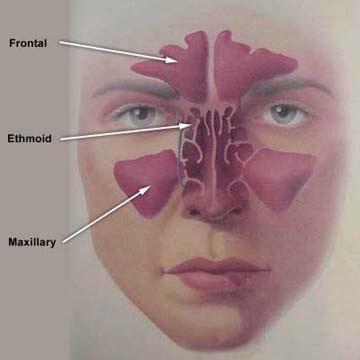 Most cases of sinusitis clear within weeks at most and these are referred to as acute sinusitis. Acute sinusitis can be a painful condition causing a dull ache or pressure sensation in the face which may be aggravated by bending down as the fluid moves in the sinus. To be classified as an acute sinusitis presence of discoursed and odorous nasal (from the nose) or post nasal (from the nose into the throat) discharge. As many sinus infections are caused by a virus an antibiotic will often not be helpful. Acute sinus infection may also cause a headache sensation, but by definition this will last no more than a few weeks at most and then resolve. It may also tend to give rise to halitosis or breadth odour. Chronic sinusitis is a sinus infection lasting more than three months. It is an accepted medical fact that chronic sinusitis is more or less painless. Patients will often self diagnose chronic headache as being a “sinus headache”. Studies in fact show that as many as 95% of what patients refer to as chronic sinus headache is in fact a form of migraine which occurs with “sinus” type symptoms including a headache, runny nose, congested feeling in face and forehead and watering eyes. Most of these “sinus” headache, resolve quickly once a migraine specific medication has been taken. It is however found that there is a higher than average incidence of migraine in those who suffer with chronic sinus conditions such as allergic rhinitis. These people will find that their nasal and sinus congestion can lead to an increased frequency of migraine. So these people will have headache but they are migraine headaches brought on by their sinus condition as distinct from sinus headache! And will respond to a migraine specific medication.